It is impossible to consider scientific innovation without thinking of laboratories. The controlled conditions found only in such environments are crucial to the success of scientific and technological experiments. When efficiently designed and equipped with the appropriate tools, laboratories can significantly facilitate groundbreaking research. Suppliers of laboratorial instruments must keep up with the fast-paced science industry and provide the necessary equipment to support advances. Rapidly evolving technologies, new discoveries, and novel research methods make this task particularly challenging. Federal R&D tax credits are available to help lab equipment suppliers fulfill their role as enablers of innovation. A recent research report by IBISWorld pointed out that, over the next few years, demand for laboratory equipment and supplies is expected to increase in response to growing investments in scientific research and development, particularly in the field of biotechnology. The same study estimates the U.S. laboratory supply and wholesaling industry’s annual revenue at $23 billion and its employees at over 34 thousand people. Improved instrumentation and equipment are important means to enhancing research capabilities. According to the Laboratory Equipment Magazine, more than 20 percent of the instrumentation and equipment in the modern research laboratory should be replaced over the next five years. 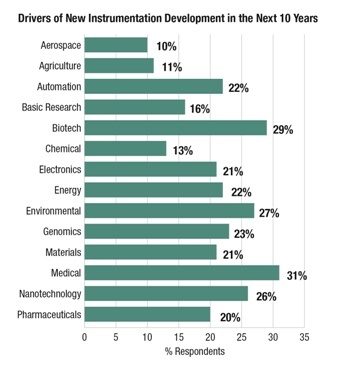 A recent survey of scientists and engineers revealed that medical and biotechnology applications are expected to be the top two drivers for the development of new laboratory instruments and equipment during the next ten years. 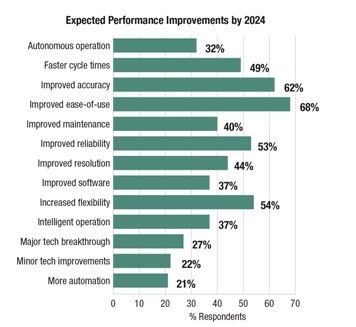 The same survey highlighted that ease-of-use and enhanced accuracy are the two most anticipated performance improvements in lab equipment. Increased flexibility, improved reliability, and faster cycle times are also viewed as important drivers of lab productivity. The following paragraphs present some of the laboratory systems expected to undergo the most changes in the near future. Data Acquisition (DAQ) Systems are responsible for sensing physical phenomena, translating them into electric signals readable by an A/D board, converting such signals into a digital format acceptable by a computer and, finally, processing, analyzing, storing, and displaying the acquired data with the help of software. DAQ systems can be used to measure temperature, voltage, pressure, light, force, displacement, among many other variants. Improvements in semiconductor devices, electronics, and electronic communication systems promise to enhance the performance of DAQ systems. Critical areas include reliability, lower costs, and ease-of-use. DAQ software is also central for high performance operations. Data acquisition software packages have gained increased importance as a simplified, customizable alternative to complex programmable solutions. Based in Austin, Texas, National Instruments has recently launched a new line of low-cost DAQ devices. With prices between $149 and $499, they constitute an alternative for basic applications such as simple data logging, portable measurements, and academic lab experiments. From Seattle, Washington, Silicon Designs, Inc. is the creator of the Model 3340 G-Logger, a three-channel, low-cost, portable DAQ system, offering powerful FFT analysis and display, as well as real-time acceleration and GPS data collection and viewing. Different from traditional systems, in which data is written to an SD card, the innovative logger offers live streaming to a host computer. Automation Systems have gained increased attention as a means to improve accuracy, repeatability, and productivity of laboratory operations. By taking the human out of the equation, such systems reduce the probability of errors. Also, their ability to work unattended for long periods of time enable enhanced equipment utilization and increased workloads. A 2013 report from MarketsandMarkets predicted that the global lab automation market should reach $4.2 billion by 2017, presenting a compound annual growth rate (CAGR) of 6.4 percent between 2012 and 2017. While automated liquid handling accounts for the major market share, microplate readers were expected to grow at the highest rate during this period. 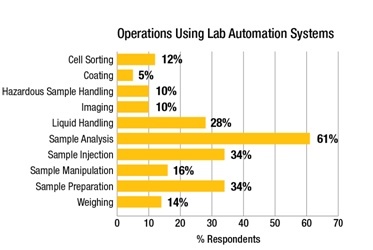 Enhancements to system software are key to a more widespread adoption of lab automation. Integration into third-party control systems and ease-of-use are important areas for improvements. Also, lower costs, increased flexibility and reliability, less maintenance requirements, and greater speed are common concerns among users. In response to such concerns, equipment manufacturers increasingly gravitate towards the development of more specific software systems, sold as analyzers instead of generalist instruments. These analyzers require little or no user programming and expertise. Headquartered in Reno, Nevada, Hamilton Company provides automated precision liquid handling solutions for laboratories. The company recently launched the Vantage, a flexible, multipurpose pipetting platform that provides simple assay programming and detailed 3D simulations, while featuring an expandable, space-saving design. The system also offers a dynamic scheduler, which optimizes runtimes even when new assays are added. It also includes a new, state-of-the-art linear motor design and contact-free NanoPulse pipetting technology covering a range of 100 nL to 1 mL. Other innovative features include the Contamination Avoidance Response (CARE), Liquid Level Detection, and Anti-Droplet Control (ADC). Thermo Fisher’s biotechnology products and services brand, Life Technologies, has also been at the forefront of lab automation. One example is the Countless II FL Cell Counter, an automated cell assay platform equipped with state-of-the-art optics and image analysis software for rapid assessment of cells in suspension. Equipped with an easy-to-use touch screen interface and a reusable counting slide that helps reduce consumable costs, the automated solution offers a full spectrum of fluorescence detection that allows researchers to count cells, monitor fluorescent protein expression, and measure cell viability. It further presents advanced autofocusing and counting algorithms that allow for a quick and accurate identification and count of cells within a population. An important aspect of automated systems is the use of sensors and detectors. Recent developments include the multiplication of wireless sensors that communicate directly with host devices, such as computers, tablets, and smartphones. An interesting example is NODE, an innovative wireless sensor platform for smart devices. Created in 2012 by Chattanooga-based Variable, Inc., NODE was financed through a very successful Kickstarter campaign. Since then, it has been integrated into a growing number of laboratories and STEM classrooms across the world. Offering an easy-to-use, cost-effective, customizable solution for collecting and monitoring data, NODE can be used to measure temperature, light, relative humidity, barometric pressure, etc. The development of super sensitive sensors capable of detecting nanoparticles is also an important area for innovation. Given that the majority of biological processes take place at the nanoscale, nanotechnology research promises to benefit society in countless ways. Researchers at the Washington University in St. Louis recently announced the creation of a Raman microlaser sensor that can detect and count nanoparticles at sizes as small as 10 nanometers, one at a time. The researchers say the sensor could potentially detect much smaller particles, such as viruses and small molecules. Laboratory Information Management Systems (LIMS) are software-based solutions that support modern laboratories’ operations. Key features include workflow and data tracking support, flexible architecture, and smart data exchange interfaces. Initially used exclusively for sample tracking, LIMS’ functionalities have expanded far beyond their original purpose, becoming essential resource-planning tools. Among their most common applications are assay data management, data mining, data analysis, and electronic laboratory notebook (ELN) integration. LIMS have been proven instrumental in helping preserve the balance between productivity and compliance with increasingly strict regulation. Enhanced traceability features, such as the ability to track aliquots and composites, finer control over samples, and more reliable data have enabled better decision-making and the easier fulfillment of new requirements. Present in over 150 countries across the globe, American multinational corporation, PerkinElmer focuses on improving human and environmental health. The company’s software products include LABWOKS, a LIMS portfolio that manages data, time, resources, and risks. Designed for ultra-configurable deployment, LABWORKS solutions can be tailored to a wide variety of laboratory needs and workflows. Its easy-to-use, flexible design avoids lengthy customization and implementation projects. The latest version of LABWORKS WebTop combines a streamlined user interface with zero footprint. The innovative solution does not require any components to be installed or resident for operation as the user’s browser-enabled device becomes a LIMS terminal. In addition to offering enhanced portability, WebTop eliminates many software compatibility issues and platform limitations. Mass Spectrometers are highly sensitive and sophisticated instruments used to identify and quantify specific molecules in complex samples. Through a process of vaporization, ionization, and subsequent manipulation by external electric and magnetic fields, they measure both the masses and relative concentrations of atoms and molecules. Very common in analytical laboratories, mass spectrometers help identify unknown compounds and determine both the isotopic composition of elements in molecules and the structure of compounds by observing their fragmentation. Pharmacokinetics, protein characterization and sequencing, and trace gas analysis are among the potential applications of mass spectrometry. Though an indisputably valuable and essential tool for chemical analysis, mass spectrometers are bulky, expensive, and time-consuming. In an effort to overcome these deficiencies, researchers at MIT’s Microsystems Technology Laboratories (MTL) are developing a new kind of spectrometry technology that is cheap, fast, and small enough to fit in one’s hand. The downsized mass spectrometer will feature nanoscale components, all of which can be produced in batches, using currently available manufacturing technologies. According to the researchers, mass production could move the price of spectrometers to around two hundred dollars, a massive decrease from their present price. Cheaper, portable mass spectrometers could go beyond the labs’ walls and become ubiquitous in offices and streets, where they could be used for air quality analysis and for detecting the presence of harmful chemicals or emissions. Chromatography Systems help analyze and identify individual components by separating them from sample mixtures. The technique consists of moving the mixture along a stationary material, such as gelatin, paper, or magnesia. Different components of the mixture are caught by the material at different rates and form isolated bands that can then be analyzed. A recent report by Transparency Market Research valued the global chromatography systems market at $6.9 billion in 2012 and predicted that it should be worth $10.4 billion by 2019, growing at a compound annual rate of 5.2 percent between 2013 and 2019. The chromatography market comprises various types of systems, such as gas chromatography, liquid chromatography, ion exchange chromatography, affinity chromatography, super critical fluid chromatography, column chromatography, and thin layer chromatography. End-users include biotechnology and pharmaceutical industries, hospitals and research laboratories, agriculture and food industries, among others. Increasingly, suppliers of chromatography systems are engaged in developing cost-effective and innovative instruments that will enable a more widespread adoption of this technology. In this context, Shimadzu Scientific Instruments, the American arm of the Japanese manufacturer of precision instruments, Shimadzu Corporation, has recently introduced the new i-Series Integrated Liquid Chromatography System. Designed for the lab of the future, the i-Series allows the direct injection of highly concentrated samples without dilution, supports high-speed multi-analyte processing with 14 second injection cycle time, and provides repeatability of 1 percent or less. Furthermore, it integrates with LabSolution software, which allows data acquired via interactive communication mode (ICM) to be sent to the lab’s data center and managed uniformly by a server. Sample Preparation is one of the most common operations in the lab. Consuming up to 60 percent of a lab’s workload, it includes several manual, error-prone steps and requires significant amounts of labor and time. Technological advances in the sample preparation market are key to simplifying the work of researchers and making it more time-efficient. The most common applications of advanced sample preparation technology include genomics, proteomics, and epigenomics. While the adoption of sample preparation instruments is on the rise, with an expected overall CAGR of 5.9 percent between 2013 and 2018, the development of “one-size-fits-all”, lower-cost kits remains a challenge. Headquartered in South Easton, Massachusetts, Pressure BioSciences, Inc. has recently announced the development of a new Pressure Cycling Technology (PCT)-based instrument system for sample preparation. PCT is a patented enabling technology platform that uses alternating cycles of hydrostatic pressure between ambient and ultra-high levels to safely and reproducibly control bio-molecular interactions. The new benchtop Barozyme HT48 is a first-in-class, high throughput instrument capable of processing up to 48 samples simultaneously using the company's new and proprietary BaroFlex 8-well processing strips. The use of a "microplate" format is considered a major improvement in the ergonomics of sample handling and a key step towards the automation of PCT-based biological sample preparation. Biotechnology has become the leading component in the life sciences industry. Defined as the exploitation of biological processes for industrial or other purposes, biotech has increasingly driven the development of new pharmaceuticals, agricultural products and processes, medical techniques and procedures, environmental technologies, and biofuel products. The Human Genome Project, which successfully determined the sequence of the entire human genome, opened the way for a new line of research and the development of innovative sequencing, analysis, software, and sample preparation technologies. Biotech companies have thrived on the back of such technological advances and have become major industrial players with unprecedented corporate value. According to a recent report by IBISWorld, the global biotechnology market experienced an annual growth rate of 10.8 percent between 2009 and 2014. Industry growth is expected to continue skyrocketing over the next five years due to a worldwide surge in biotech investment. In this context, biotechnology stands out as a major driver of innovation in lab equipment and instrumentation. According to a recent survey by the Laboratory Equipment Magazine, imaging systems and microscopes are among the most used devices in a biotech lab. Over the past years, dramatic advances in these systems have provided researchers with novel bioscience information and unprecedented capabilities. This is a clear example of how lab equipment innovation supports research. Based in Culver City, California, Sofie Bioscences combines new PET imaging agents with innovative imaging and synthesis systems to provide researchers and physicians with tools to better investigate the biology of disease. In partnership with PerkinElmer, Sofie recently launched a new translational imaging system, which integrates PET and CT into an innovative benchtop system that will enable preclinical workflows for biologists, biochemists, and pharmacologists. The G8 PET/CT Imaging System was purposely developed for small animal imaging. With unparalleled sensitivity, it offers advanced automatic co-registration of acquired PET and CT data generating tomographic, whole body images with organ-level anatomical references. Other features include ultra-fast automatic image reconstruction, real-time respiratory monitoring, and advanced data acquisition and analysis software. The incorporation of innovative imaging systems into biotech labs is expected to support the advancement of translational research and accelerate the analysis, understanding, and treatment of diseases. Impacts should be particularly significant on biodistribution, ADME/Tox, oncology, and neuroimaging applications. Improvements in computer processing power, storage capabilities, and software systems are also central to the modern biotech lab. Computational applications in biotech research involve managing and analyzing large sets of data, which is particularly important for genomic research efforts. According to a 2012 report by Transparency Market Research, the global bioinformatics market is expected to reach $9.1 billion in 2018. Over the last years, DNA sequencing equipment has been a continuous focus of innovation. Genome-based research promises to enable medical science to develop highly effective diagnostic tools, to better understand the health needs of people based on their individual genetic make-ups, and to design new and highly effective treatments for disease. Earlier this year, San Diego-based Illumina launched its new sequencing machine capable of delivering up to five genomes a day, with a cost of just under $1,000. The HiSeq X Ten is expected to enable the analysis of complete genomic information from massive sample populations, paving the way for an unprecedented understanding of the genetics of human disease. 3D bioprinting, which consists of using living cells in additive manufacturing, is yet another promising area for innovation. When equipped with 3D bioprinters, biotech laboratories can create cellular tissues for drug testing and medical training, and develop transplantable organs. Headquartered in San Diego, California, Organovo Holdings, which has already created 3D bioprinted, functional liver tissue, is working with Autodesk to design a modern, cloud-based bioprinting software. Eventually, the next generation meta platform is expected to incorporate mathematical formulas that account for the cellular processes involved in bioprinting. Different from nonliving 3D printing, which presents unchanging design, 3D bioprinting must consider dynamic processes such as the self-assembly of stem cells. The creation of specific software and efficient stem cell identification and harvesting technologies are necessary steps in the integration of 3D bioprinting into biotech labs. An efficient and effective lab environment is the cornerstone of innovation. Suppliers of lab instruments and equipment have a unique role to play in supporting and enabling much-awaited advances in life sciences research. The growth of the biotech industry, the increasing automation of laboratories, along with improvements in data acquisition, mass spectrometry, and sample preparation systems are fueling a new wave of lab instrumentation R&D. Federal tax credits are available to help companies equip the labs of the future.